张宁宁, 钟萍, 杜文成, 等. 基于地基GPS的新疆地区大气可降水量时空分布特征[J]. 大地测量与地球动力学, 2019, 39(1): 41-44. ZHANG Ningning, ZHONG Ping, DU Wencheng, et al. 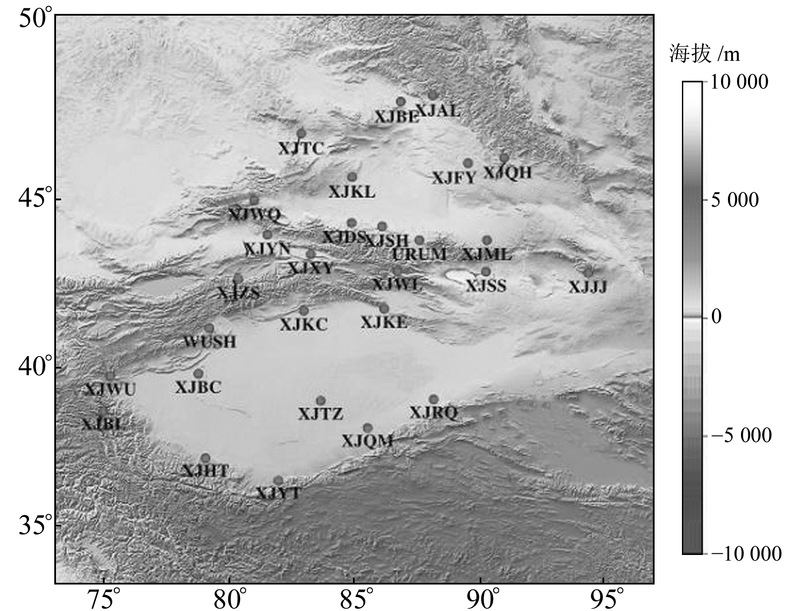 Temporal-Spatial Distribution Characteristics of Precipitable Water Vapor in Xinjiang Based on Ground-Based GPS[J]. Journal of Geodesy and Geodynamics, 2019, 39(1): 41-44. National Natural Science Foundation of China, No. 41374002; Science and Technology Program of Sichuan Province, No. 2015JQ0046. ZHONG Ping, PhD, associate professor, majors in high precision GNSS data processing and crustal dynamics, E-mail:zp@swjtu.edu.cn. ZHANG Ningning, postgraduate, majors in geodesy, E-mail:nnzhang609@163.com. Foundation support: National Natural Science Foundation of China, No. 41374002; Science and Technology Program of Sichuan Province, No. 2015JQ0046. About the first author: ZHANG Ningning, postgraduate, majors in geodesy, E-mail:nnzhang609@163.com. Corresponding author: ZHONG Ping, PhD, associate professor, majors in high precision GNSS data processing and crustal dynamics, E-mail:zp@swjtu.edu.cn. Abstract: The precipitable water vapor of stations in Xinjiang in 2016 is derived, according to the GPS data of the crustal movement observation network of China, combined with the pressure and temperature of the ERA-Interim model. The spatial distribution and seasonal variation of precipitable water vapor in this area are also analyzed. The results show the feasibility of GPS precipitable water vapor according to the comparison of radiosonde and GPS precipitable water vapor, which has a root mean square error of about 2.7 mm. Secondby, the annually averaged precipitable water vapor in Xinjiang is from 7.0 to 13.0 mm. Altitude is the main factor affecting the spatial distribution of GPS-derived precipitable water vapor; that is, precipitable water vapor decreases by about 1.4 mm for each kilometer increase of altitude. For regions at the same altitude, a region that is located at a lower latitude will have a higher content of precipitable water vapor. Thirdly, the seasonal variation of the precipitable water vapor is apparent. The precipitable water vapor is maximum in summer from 12.0 to 23.2 mm, the minimum is in winter, from 1.4 to 5.5 mm. The difference of precipitable water vapor between spring and autumn is quite small, and the changes are between summer and winter.